I have a good feeling about Force India, in spite of the team's awkward name. There are excellent signs emanating from the revitalized outfit, not the least of which is the news today that Vijay Mallya, co-owner with Michiel Mol, has put $50 million more in the budget than last year, with the promise of more if needed. Another encouraging factor has been the amount of publicity generated by the team over the holiday period. Traditionally a time of little F1 news, Force India has kept the media busy with speculation over their driver choices and advertising on Indian television. The cynic might say that this is a big fuss about nothing but it does illustrate how serious and extensive Mallya's ambitions for the team are. Funding has always been the Achilles heel of the small F1 team but it seems that the Jordan/Midland/Spyker successor is getting this right before anything else. As well as Mallya's investment, the team is perfectly placed to tap into India's enormous potential for sponsorship and Mallya is already talking to several interested corporations. The ambition spreads far into the future, too, with talk of the contracted drivers acting as talent scouts for gifted Indian go-kart competitors. One can feel the desire behind such a scheme, an intention to follow in the footsteps of Ron Dennis in picking a talented youngster very early on and shepherding him through the years into final championship contention. With the finances sorted out so happily, Force India stands at least a chance of moving up the grid to the midfield, and perhaps even further in the future. Money is not the only requisite for success, as Toyota have so effectively demonstrated, but it is a necessay ingredient. Add to that the fact the team is still essentially the old Jordan team, with the excellent addition of Mike Gascoyne, and it would seem that personnel is not going to be a problem either. 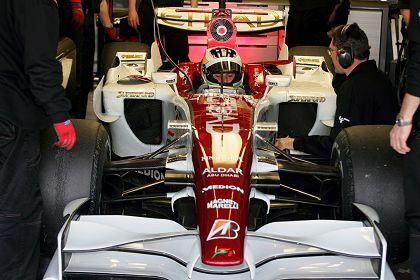 The driver choice is sound, combining one of the bright new F1 talents, Adrian Sutil, with the experience and ability of Giancarlo Fisichella. Vitantonio Liuzzi as test driver is not a bad option either and he will be ready to step into a race seat should either of the contracted drivers fail. Perhaps most important of all, Mallya is keeping his feet on the ground, aware that success will come only after a long and hard battle. He is not expecting miracles but is determined to see the team succeed in the long run. All new teams start off with high hopes but rarely do they have as much cause for optimism as do Force India. In fact, it is hard to imagine more favorable circumstances surrounding any new entry to F1. I think we will see steady but sure progress from this team in future seasons - perhaps even a return to the glory of Jordan's greatest years. I am very proud that Mallya is serious about Force India project than the previous owners. But i think expecting a podium for the first Indian Grand Prix at 2010 is still highly ambitious although i wont say it is impossible. $350 million budget, two teams generating test data, Adrian Newey and Geoff Willis, competent drivers....still Redbull cant confidently say they can fight for podiums on merit. May be it will change next year. We will have to see. I would consider Mallya's efforts to be a big success if he can get the team back to respectability and fan support of the Jordan of the past or like Super Aguri now and I have a good feeling it will happen. I almost feel odd agreeing with you on this, but I actually do. The signs are looking at their brightest since Jordan were on the up with Hill and Frentzen in the late '90s. Of course, we still need to see the car run, but at least the attitudes and staff look better. It's great, isn't it, Uppili? Vijay Mallya has done all the right things to really give the team new impetus and hope. He strikes me as being a man who is realistic yet absolutely determined to achieve his ambitions - exactly what the team needed. The first sentence of your comment reminds me of something I forgot to say, Ollie - that all the publicity and news of Force India has generated a huge amount of goodwill from the F1 public. And that is an achievement in itself; we have all seen over the last year how hype can actually produce the opposite to the desired effect, leaving the fans jaded and turning against the product. I think Mallya's secret is that he has kept everything within realistic bounds, refusing to become over-optimistic and making no exaggerated claims. And I must say that car looks awesome ! Fingers crossed it performs as good as it looks.